REAL PEOPLE. REAL STORIES. REAL ADVENTURE! Quality curriculum-linked educational programs delivered by friendly and knowledgeable interpreters at Dundurn Castle, The Hamilton Military Museum, Whitehern Historic House & Garden, Battlefield House Museum & Park, Hamilton Museum of Steam & Technology, Hamilton Children’s Museum, Fieldcote Memorial Park & Museum, Griffin House, and the Hamilton Farmers’ Market. Museums have aligned current programming to reflect the revised Ontario Curriculum for Social Studies, History and Geography. We are committed to offering the enquiry-based learning style outlined by the citizenship education framework. 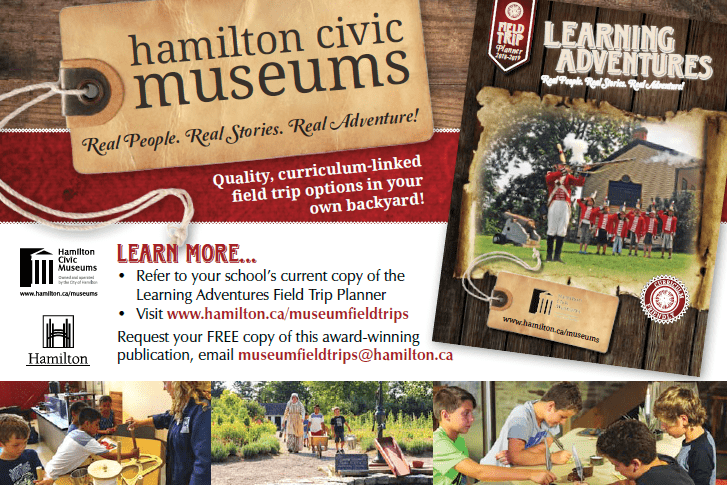 Please contact us for your free copy of our user-friendly Learning Adventures Field Trip Planner declared Best Printed Collateral Material in Ontario by Ontario Tourism Marketing Partnership in 2006. Outreach and “Lunch & Learn” programs are also available.